George Harris was born in Yetminster, Dorset, in 1791 and baptised there on 25 December 1791. He was the son of Edward and Mary Harris. On 4 December 1816 at Bradford Abbas, Dorset, he married Grace Sherring. the daughter of Emanuel Sherring (b1766, Bradford Abbas) and Ann née Pavitt (b1770, Sherborne, Dorset). George and Grace initially set up home in Mudford where their first daughter Sarah Sherring Harris (1819-1867) was born. They soon moved to Yeovil where their following four children were all born; Emma (b1821), Elizabeth (b1826), Louisa (b1826) and George Sherring (1830-1906). It is known from a lease dated 1822 that George was working as a carpenter at this time and he leased "two cottages and a cellar or wringhouse [a building to house a cider press] adjoining and a plot of land in the manor of Kingston juxta Yeovil" on the lives of "Harris for 99 years and George Custard, George Jesty and William Jesty". In 1825 "the new road belonging to Peter Daniell" - today's Brunswick Street - was laid out. By 1835 many of the houses had been built along the new road and it was recorded that George Harris owned numbers 2 to 11 inclusive of both odd and even numbers. These were, presumably, sold off by the time of the Tithe Apportionment of 1846 as George's name is not recorded in the street. The suggestion is, therefore, that by this time George was a builder (he would be recorded as such in the following 1841 census) and probably built the houses. 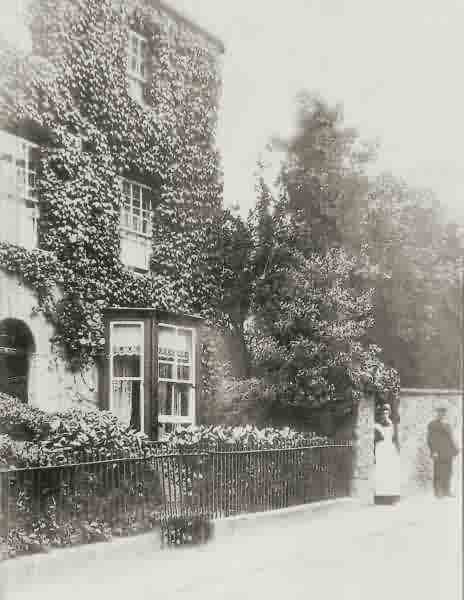 George and Grace lived at one of the two three-storey, semi-detached houses known as Victoria Place which would later become known as 1 and 2 Clarence Street (see Gallery). It is likely that Victoria Place was built around 1837 as Queen Victoria ascended the throne - certainly the houses are not shown on earlier maps. 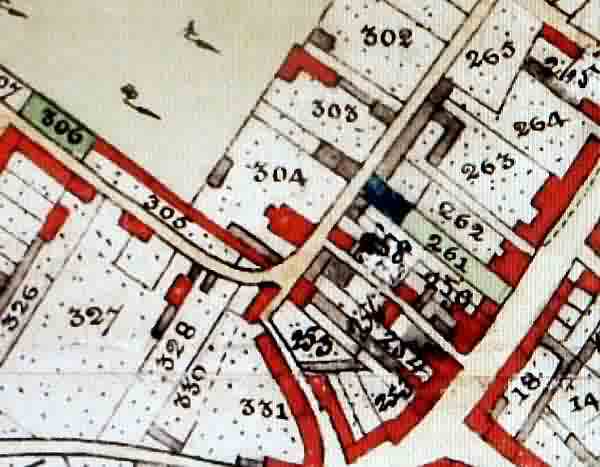 The houses appear on the 1842 Tithe Map (see below) as Parcel 304 but unfortunately the names of the owner and occupier of Parcel 304 are not recorded in the associated Tithe Apportionment of 1846. Since George is known to have been an affluent builder it is likely that he built Victoria Place himself. Certainly in the 1841 census George and Grace, together with their three younger children and a servant were recorded at Victoria Place where George gave his occupation as a builder. He is also known to have been a brickmaker - it was common at this time for builders to also be brickmakers in Yeovil - and had a "brickworks, etc" (see map) between Mudford Road and Sparrow Lane (today's Sparrow Road) as well as the neighbouring field called Roping Path. He also owned a terrace of houses in Sparrow Lane (see Gallery) and another terrace, Parcel 603 in Huish Field, off Huish close to today's Beehive Inn. By the time of the 1851 census 59-year old George was still at Victoria Place with Grace, Elizabeth, George Jnr and 6-year old grandson Frederick Dodge (George and Grace's eldest daughter Sarah had married Charles Dodge). George Snr gave his occupation as a timber merchant, 27-year old Elizabeth was a dressmaker and 20-year old George Jnr worked as an accountant. Their neighbour at this time was George Bengefield, a "Smith & Iron Founder employing 3 men" suggesting that the iron foundry (later to become the Petter & Edgar foundry) had recently been built - essentially at the bottom of George's garden. The whole site, including both foundry and Victoria Place, today is of course the southeast corner of Tesco's car park. From a court case, Harris v. Culliford, reported in the Western Flying Post's edition of 20 September 1859 George Harris was quoted as saying "I am a builder in this town and am in the habit of buying and selling furniture." In the 1861 census George and Grace, together with daughter Elizabeth, were still at Victoria Place. George described his occupation as a builder. In the spring of 1867 Grace died and in the following 1871 census 79-year old George was listed at Victoria Place, albeit now renamed Clarence Street, with his 23-year old granddaughter Sarah Dodge as his housekeeper. His son George Jnr lived next door with his young family, at No 2 Clarence Street. Both father and son gave their occupations as "Income from houses". George Harris died while in Wimborne, Dorset, in the autumn of 1872. He was aged 81. George Sherring Harris, seen at left, the only son of George and Grace, was born on 5 August 1830 at Yeovil and baptised on 12 September 1830 (the Harris family were Nonconformists). As noted above, he lived with his parents at Victoria Place and worked as an accountant until his marriage to his cousin Charlotte Sherring (1830-1901) in the spring of 1854 at Yeovil. Charlotte was the daughter of George's mother's brother John Sherring. Throughout their marriage George and Charlotte lived next door to his father in Victoria Place, later No 2 Clarence Street (see Gallery). George and Charlotte were to have two sons and four daughters, all born in Yeovil; George John Sherring (1854-1879), Herbert Andrews (b1856), Louisa Charlotte (1861-1955), Emily Ann, known as Emmie (1864-1919), Bessie Grace (1867-1969) and Alice Maud, known as Maud (1872-1963). In the 1861 census George and Charlotte, together with their sons George and Herbert, were listed at Victoria Place and George Snr gave his occupation as "Shop Keeper & Beer Retailer". His working life was soon to end as by the following 1871 census (and for the rest of his life) George lived off the "Income from Houses". Never a well man (he suffered from frequent attacks of bronchitis) he had a nasty accident in March 1874 at Durston Station. Changing trains in the dark he walked into a track-changing lever on the platform and severely damaged his knee. He sued the Bristol & Exeter Railway Company and was awarded damages of £50 (around £25,000 at today's value). 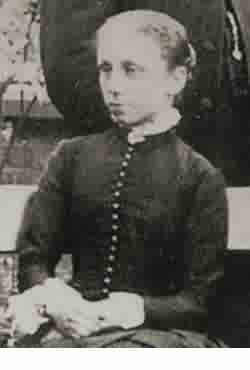 On 10 March 1901 Charlotte died, aged 71. She had been plagued by a number of illnesses and, according to her daughter's diary, was incredibly accident prone - including being hit by a horse and cart, knocked over in the street by a cyclist and hit by a cricket ball (not, I hasten to add, all at the same time). In the 1901 census George was listed as a 70-year old widower, still "Living on own means" with his four daughters - all who remained lifelong spinsters. 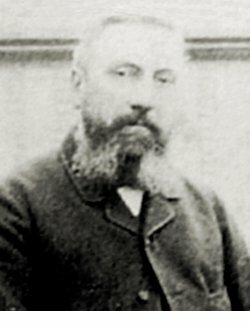 George Sherring Harris died at home on 12 March 1906, aged 75. Louisa was the eldest daughter of George and Charlotte. She was born in Yeovil (almost certainly at home at Victoria Place, later No 2 Clarence Street) in 1862 and baptised on 19 October 1862. A lifelong spinster, Louisa was confined to a wheelchair throughout her life which tended to limit her activities although her diaries reveal that she had a surprising number of excursions - either being pushed in her wheelchair (even reaching the summit of Wyndham Hill), being driven in horse-drawn carriages or by railway. Being of independent means, the family enjoyed numerous outings, holidays and visits. Louisa kept a journal from 1886 until 1926 and although much of it relates to the illnesses endured by what comes across as a very sickly family, it is important as a record of life in Yeovil during this time. In 1920 Louisa and her two surviving sisters (Emmie died in 1919) left Yeovil and moved to Weymouth. All lived to a good age; Maud died in 1953 aged 80, Louisa died in 1955 aged 93 and Bessie died in 1969 aged 101. All three sisters are buried in Yeovil cemetery beside the grave of their parents. A section of the 1842 Tithe Map of Yeovil by Edward Watts. Huish runs from top left to centre where it joins what would become Clarence Street, running off to top right. At centre this is the first time Victoria Place appears on a map - albeit un-named as such and simply recorded as Parcel 304. Also taken from the 1842 Tithe Map, this shows Fiveways at bottom left with Preston Road, Ilchester Road and Mudford Road radiating from it and Sparrow Lane (today's Sparrow Road) running across the bottom right sector. At lower centre, the houses (about eight) and gardens of Parcel 1063 off Sparrow Lane were owned by George Harris (and occupied by John Adams at this time). He also owned a further terrace of houses in Huish. Parcel 1065 was a field known as Roping Path and Parcel 1066 was a "brickworks, etc" - George Harris is recorded in the 1846 Tithe Apportionment as being the owner / occupier of both parcels. No 2 Clarence Street, formerly Victoria Place, the Harris family home from at least 1841 until 1920 when the surviving daughters moved to Weymouth. The house was possibly built by George Harris who was an affluent builder. Cottages in Sparrow Road photographed in 1956, looking west towards Mudford Road. 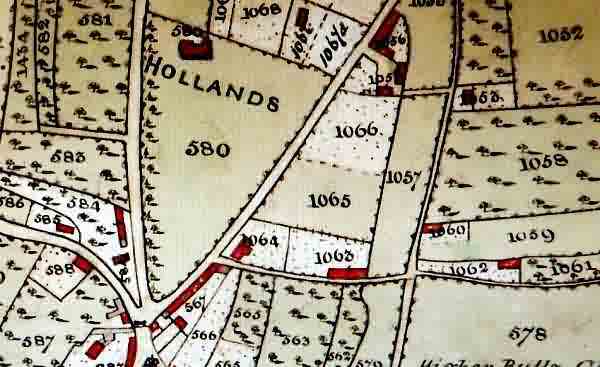 These are the cottages owned by George Harris in 1842 and shown on the second map above as Parcel 1063. 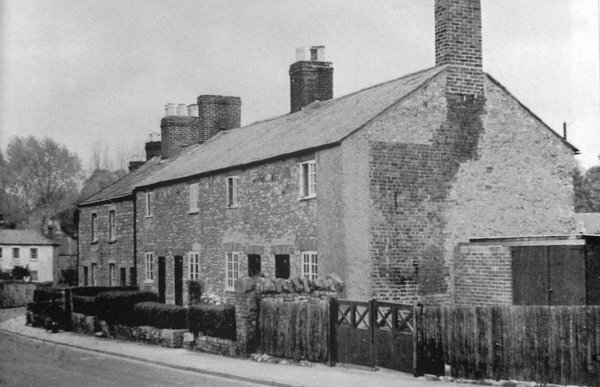 The cottages, typical of Yeovil, were built in local Yeovil stone that was affected by heat from fires hence the flues often had to be rebuilt in brickwork as seen on the end house here. Standing (left to right): Herbert, George Sherring Harris (father), Emmie. 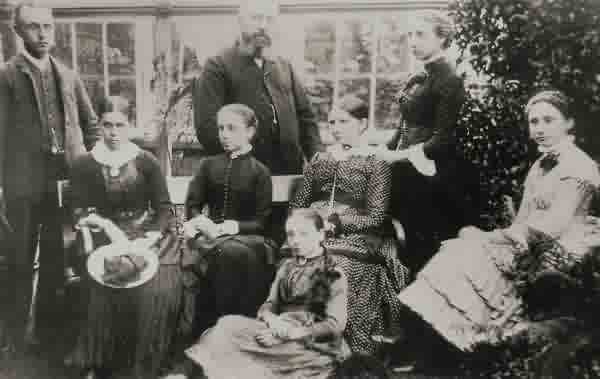 Seated (middle row, left to right): Emily (Herbert's wife), Louisa, Charlotte (mother), Bessie. 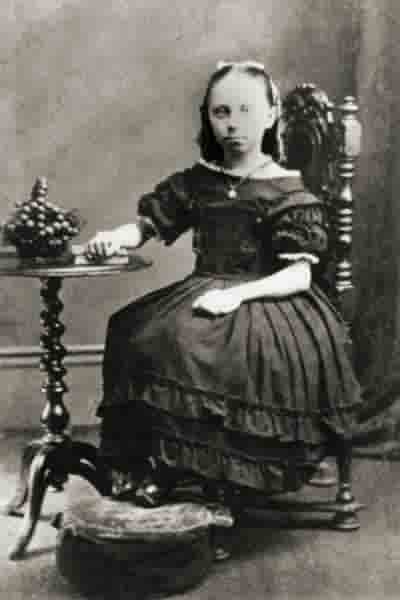 Louisa Charlotte Harris (1861-1955) aged about ten. Louisa was wheelchair bound throughout her life. She wrote a diary giving delightful insights into life in Victorian and Edwardian Yeovil. 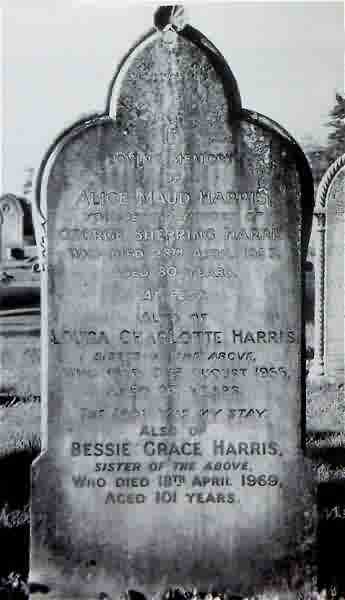 The grave of spinster sisters Alice, Louisa and Bessie Harris in Yeovil Cemetery.